Well, it's been a little while, hasn't it? Time to start to get back into the swing of things, or so I thought. I started to write this blog post several weeks ago but things just kept getting in the way of it getting posted. For some reason, I couldn't log onto my blog which was very annoying. I'm not particularly computer literate so this was a real challenge for me. I managed to sort it out, only to catch a cold that turned into a very nasty respiratory infection and that really kept me down. Even the smallest of things made me tired and out of breath. But, thankfully that is a thing of the past and I'm getting better every day. I've been home for a few weeks now and after slowly making my way through the nice stack of mail that was awaiting me when I arrived, I feel blessed to have so many nice letter friends. What an assortment of letters, pocket letters, cards and an especially nicely crafted letter from the lovely Lady Pamela from The Lost Art of Letter Writing...Revived Opening this letter was such a treat. It was beautifully packaged with so much attention to detail that I took great care in opening it and just savouring the goodness. Getting a letter from a fellow Janeite is always nice but what a delight to receive something that is more like a gift. I just simply adored everything about this packet, and especially the letter it contained which was a crossed letter written in pen and ink. Thank you Lady Pamela for a truly extraordinary missive! It took me a few days to get through all the mail...these things cannot be rushed, they must be savoured. I just meandered my way though all the mail goodness and enjoyed the process of catching up with all my pen pals. I also received two pocket letters, one which was from a swap I entered before I left to go home and the other from the lovely Tina whom I know from Swap-bot Both letters were pretty to look at and held such treasures. I think pocket letters are a very fun way to send a letter. I like the versatility and the element of surprise that each little pocket contains. You can use a theme or just do something random and it always looks pretty and colourful. I would like to do a lot more pocket letters once I answer all my mail. There are always several themed swaps over on swap-bot to choose from for inspiration, or you can just wing it and do your own thing. Whatever you do, it's sure to be a hit with your pen pals. 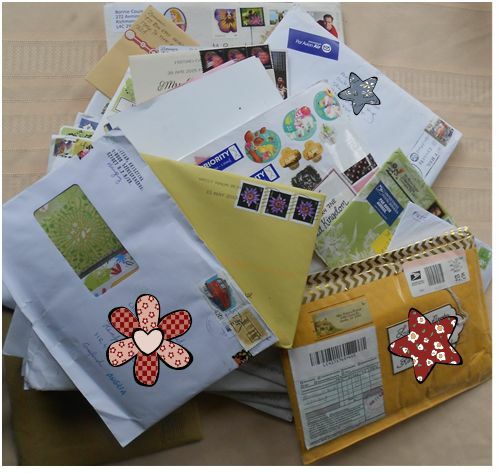 Now comes the pleasant process of replying to all my lovely letters. Time to put the kettle on, this will take a while, I know, and I hope my pen friends will be patient with me. Being ill has made for slow progress, but I am trying to write at least one letter a day. See you in the mail! Welcome home. That is quite a pile you have there! Hi Mia, it was a great stack of mail to wade through. I don't often get much mail at one time so it was really fun. Welcome Back...and I do hope you feel better! Thank you Lady Pamela, I'm feeling much better. I've been mentally desigining my reply to you. I just love making pretty letters. It's nice to get back into the things I like best. I have a letter in the works to you. A trip to the post office is in order. Hey! :) It's so good to have you back--a clear sign you're in a better place. I'm glad you had mail. Sometimes it's as good as a tonic. Thanks for your lovely mail! You're so thoughtful. It feels nice to be writing again and enjoying my favourite things. A letter is on its way to you!